4 Corner IT is a managed services provider headquartered in Fort Lauderdale, Florida located in the Marina Mile business park. Our company also services businesses in the Tri County area including Miami and West Palm Beach. We work with small, medium and enterprise-sized companies. We offer IT Support plans that are tailored to almost every industry and every size. We work with many healthcare, legal, manufacturing and financial firms however, our clients range from the full spectrum of the business market. 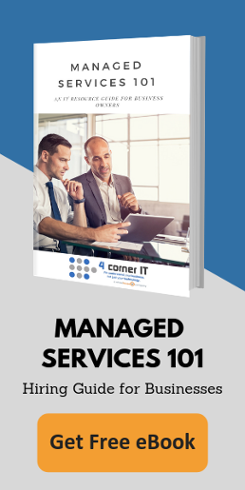 Being a pioneer in the industry means we have seen many faces of managed services, which is a term coined as an all-encompassing service desk including but not limited to; IT Support & Management, Project Deployment, Cloud Services, and more. Initially 4 Corner IT began as a web development company, providing the Greater Fort Lauderdale, Miami & West Palm Beach area with IT Support & Internet Marketing services. 4 Corner IT started in Fort Lauderdale, Florida as an internet marketing and web development company known as InterMakers in 2000. We have realized that the true business partnership is a strict focus on the technology market, going above and beyond the usual client-vendor relationship. In addition, we also utilize our partnerships for our clients benefit, we may not for example, be security camera technicians but then we work with companies like this all day long, poking and prodding for the most responsive, reliable, and friendly consultants in the industry acting as a liaison on your organizations behalf. We have a dynamic and friendly staff and always extend an invitation to come and meet our team. Aside from our consistent growth we have acquired two companies in South Florida area as well as opened an office in the New York City area. Our New York office is in Rockville Centre, Long Island within miles of the city. We serve the Tri state area through that office while the majority of our clients remain in the South Florida region.